Expanded Cinema is a relatively new visual medium/form. It combines the visual power of film with the preoccupations of the other visual art forms. It is within this medium that a recognisable and tangible relationship occurs between film and the other visual arts. This is one of the reasons why expanded cinema is one of the most exciting prospects for the visual arts in the future. Expanded Cinema means many things. For the Festival of Expanded Cinema at the ICA in january the selection panel hazarded some categories: the elaboration of screen space, multi-projection as inter-related image, environmental documentation, environmental, diaristic, participation/events, installation, performance and other works which were a mixture of some or all of these. Having listed some categories used to date, it is important to say that expanded cinema is a dynamic, evolving art form. One of its major contributions is its inclusion of live performance by the artists. We are including at least two performance pieces in the event here. 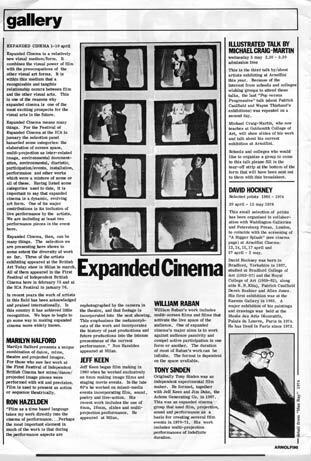 Expanded Cinema, then, can be many things. The selection we are presenting here shows to some extent the diversity of work so far. Three of the artists exhibiting appeared at the British Art Today show in Milan in march. All of them appeared in the First Festival of Independent British Cinema here in february 75 and at the ICA Festival in january 76. In recent years the work of artists in this field has been acknowledged and praised internationally. In this country it has achieved little recognition. We hope be able to go some way to making expanded cinema more widely known. Marilyn Halford presents a unique combination of dance, mime, theatre and projected images, For those who saw her work at the First Festival of Independent British Cinema her mime/dance/ projected image pieces were performed with wit and precision. Film is used to present an action or sequence theatrically. "Film as a time based language takes my work directly into the cinema of performance. Perhaps the most important element in much of the work is that during the performance aspects are rephotographed by the camera in the theatre, and that footage is incorporated into the next showing, This emphasises the metamorphosis of the work and incorporates the history of past productions and future productions into the intense presentness of the current performance." Ron Hazelden appeared at Milan. Jeff Keen began film making in 1960 when he worked exclusively on 8mm making image films and staging movie events, In the late 60's he worked on mixed-media events incorporating film, sound, poetry and live-action. His recent work includes the use of 8mm, 16mm, slides and multi-projection performance. He appeared at Milan. William Raban's work includes multi-screen films and films that activate the live space of the audience. One of expanded cinema's major aims is to work against audience passivity and compel active participation in one form or another. The duration of most of Raban's work can be infinite. The format is dependent on the space available. Originally Tony Sinden was an independent experimental film maker, He formed, together with Jeff Keen and Jim Duke, the Achme Generating Co. in 1967. This was an expanded cinema group that used film, projection, sound and performance as a basis for creating several film events in 1970-71, His work includes multi-projection performances of indefinite duration.